A Protection Pack (also referred to as Environmental Protection Pack or EPP) is back armor piece that protects its wearer from planetary hazards. Each EPP tier protects against a new planetary hazard, while providing the same abilities as all previous EPP tiers. Each EPP is crafted at an anvil or one of the upgraded variants thereof. You can get a Protection Pack from ...? 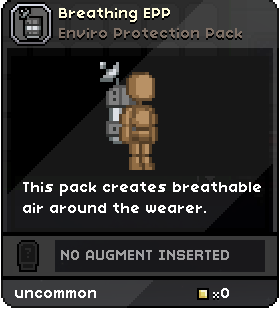 Allows wearer to breathe in airless environments, such as moons, asteroid fields and while immersed in liquids. Same effects as previous EPP, and makes wearer immune to the deadly radiation planetary hazard. Same effects as all previous EPPs, and makes wearer immune to the deadly chill planetary hazard. Same effects as all previous EPPs, and makes wearer immune to the deadly heat planetary hazard. As well as their standard function, EPPs are the only item which can be fitted with Augments. Augments can provide the player with a variety of stat boosts, movement enhancements and other beneficial status effects, and are applied by selecting the desired augment and right-clicking with it on the EPP in the inventory. Augments can be purchased from Lana Blake at the outpost after completing the Apex Mission. She will sell 3 different augments each day. Applied augments appear in the tooltip for the protection pack they've been applied to. Applying a new augment destroys the previously applied augment. Upgrading an EPP, which consumes the previous tier of EPP in the crafting recipe, will also destroy augments. This page was last modified on 21 January 2019, at 22:40.